In 1929 St. Petersburg, Florida, then a small tourist city on Tampa Bay, was suffering from the effects of the Great Depression and Prohibition. In Havana, Cuba, a great 400 year old port city, the rum was flowing and the night life was unsurpassed. George S. Gandy, Jr. ("Gidge Gandy), a well known yachtsman and son of the builder of the first bridge across Tampa Bay, had sailed his sturdy 36' ketch Cynosure to Havana. He saw an opportunity. He approached Commodore Rafael Posso of the elegant Havana Yacht Club and a partnership to conduct a St. Petersburg-Habana yacht race was born. The SPYC race documents used the Spanish spelling for Havana, likely in recognition of the Havana club's essential role in this event. (In Spanish, the "b" is spoken as a "v.") In recognition of the Cuban government's cooperation in restoring this event, that courtesy will continue. The first race started off The Pier in St. Petersburg March 30, 1930 and finished in the lee of Morro Castle at the Habana harbor entrance. It drew an eleven boat fleet and was won by the elegant schooner Haligonian owned by Houston Wall of Tampa. By 1935 the fleet had doubled in size and this event was attracting the best ocean racing yachts from the US Eastern and Gulf coasts, the Great lakes and Cuba. The race was sailed over the same 284 nautical mile course from 1930 through 1959 with the exception of three years of World War II, when racing was cancelled, and 1958 when political conditions in Cuba required a diversion of the fleet to Miami. Despite the uncertainties, the 1959 race attracted a record 37 entries, but it was to be the last - until the upcoming revival of this challenging race in 2017. How good was this race? Participants included repeat appearances by great US yachts such as Haligonian, Vamarie, Stormy Weather, Dorade, Blitzen, Babe, Ticonderoga,Carribee, Starlight, Windjammer, and Hoot Mon, and the equally great Cuban yachts Ciclon (1st in fleet 1947) and Criollo (1st in fleet 1957). 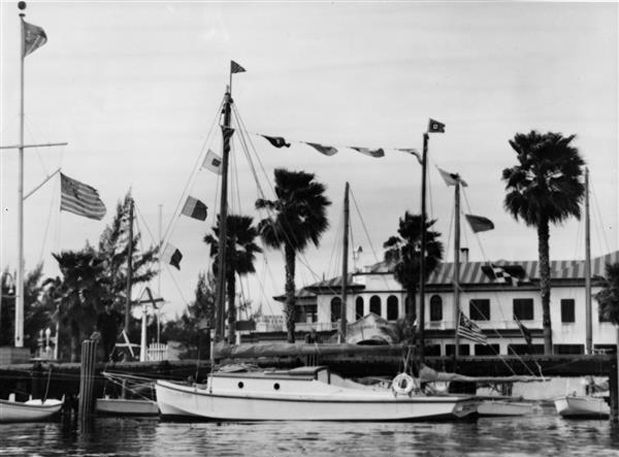 Beginning in 1940 the St. Petersburg Yacht Club and the Miami Yacht Club took the lead in organizing a winter series whose two high point count races were the Miami Nassau Race and the St. Petersburg-Habana Race. After the demise of the Habana Race, the St. Petersburg to Fort Lauderdale Race was inaugurated in 1961 and the fleet quality and quantity momentum from the 1950's carried over into the fabled Southern Ocean Racing Conference series known as the "Circuit." A teenager named Charley Morgan sailed in the 1948 race as a crew member on Redbird, a 36' wooden yawl from his then hometown, Tampa. In the early 1950s he established a sail loft in St. Petersburg. In 1960 he stunned the yachting world with his breakthrough design of Paper Tiger, a 40' fiberglass yawl built for SPYC's Jack Powell which proceeded to win the Circuit in 1961 and repeat in 1962. Morgan yachts may be found all over the world today. The Circuit drew large fleets of top international offshore racers until the late 1980's, following which it suffered an abrupt demise; the commonly cited cause was frustration with handicap rule changes which abruptly ended the competitive racing life of many excellent boats. The lure of offshore racing, however, has never died and the 2017 St. Petersburg-Habana Race will will offer the same challenges which attracted great sailors in the past coupled with the opportunity to experience Habana and to contribute to the normalization of relationships with our Cuban neighbors.